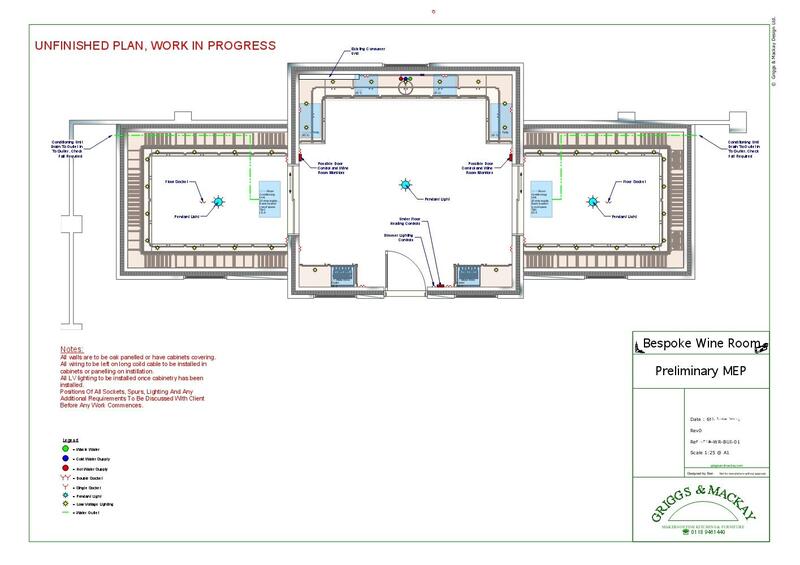 Thinking about the layout of a new bespoke kitchen can sometimes be the trickiest part of the design process. 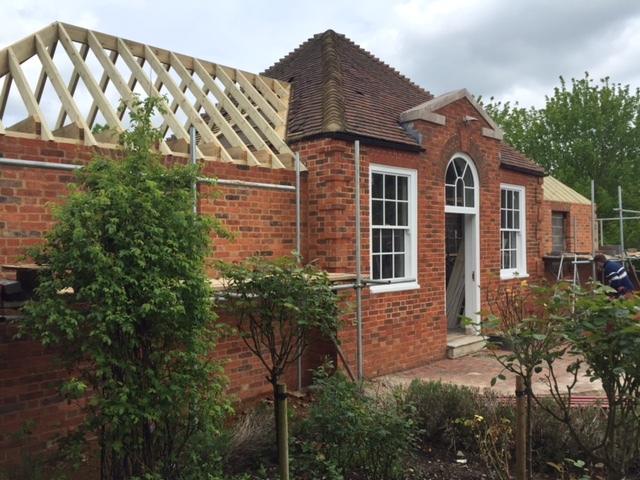 If it isn’t decided during the initial planning stages, it can end up being both costly and time consuming! Many kitchen design companies have a limited portfolio of off-the-shelf options, which may work well for your space. 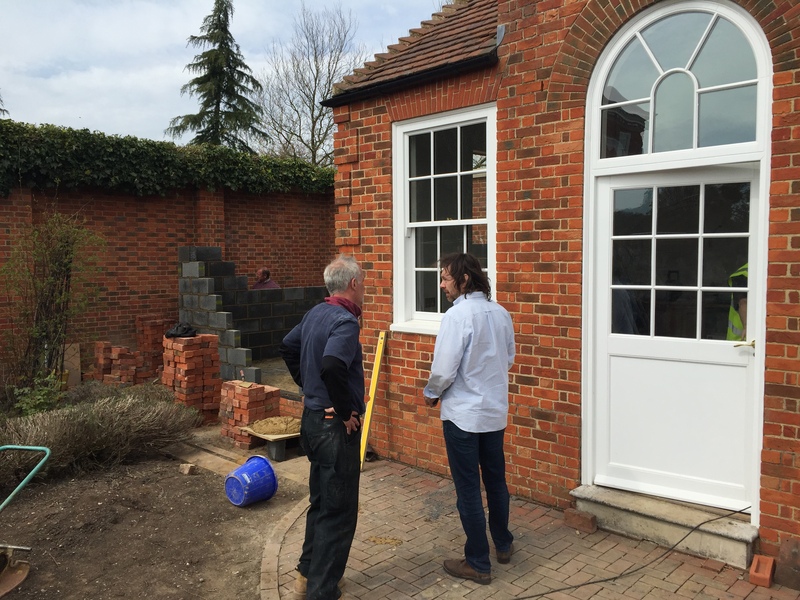 However, by working with bespoke designers like us, there is a limitless range of ideas and possibilities. 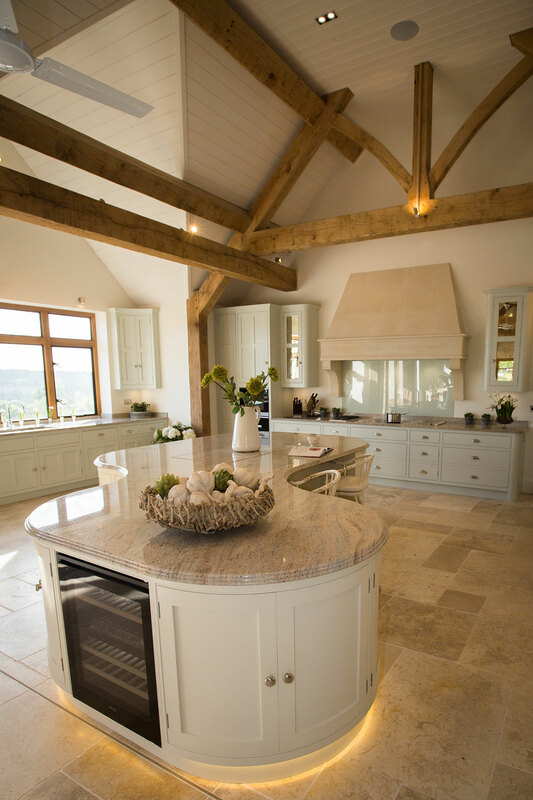 At Griggs & Mackay, we like to spend ample time discussing how you want to use your kitchen space, as well as how your kitchen should look and feel. 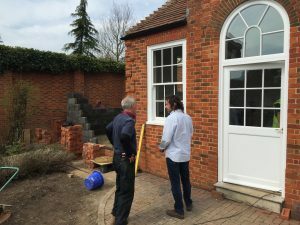 Our talented architects and builders use their knowledge and expertise to implement your vision, creating a space that’s right for you and your home. 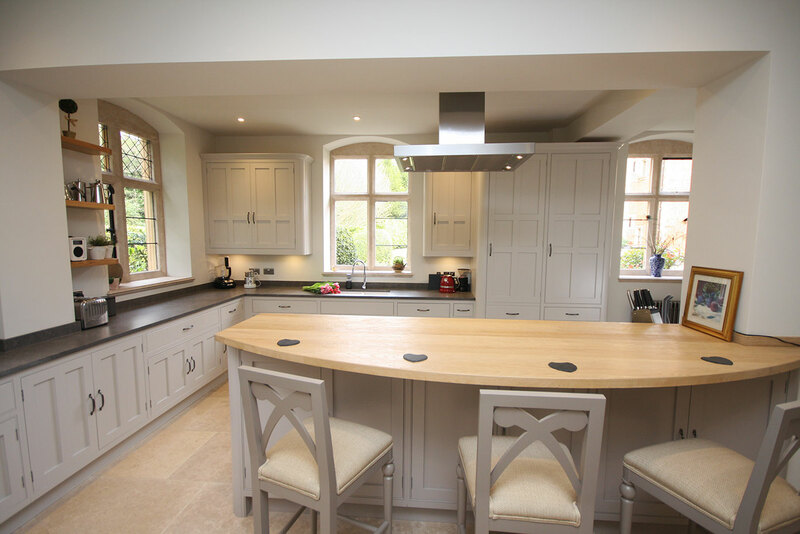 As a very much design led kitchen-maker, the look and feel of your kitchen are very high on the list of our priorities, but we will always advise you if the design moves away from functionality. 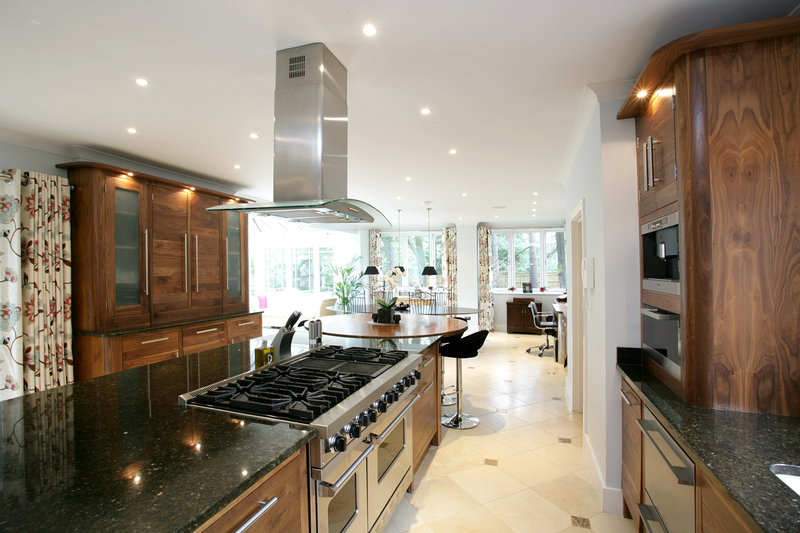 Firstly, it’s important to think about how your kitchen space will be used. 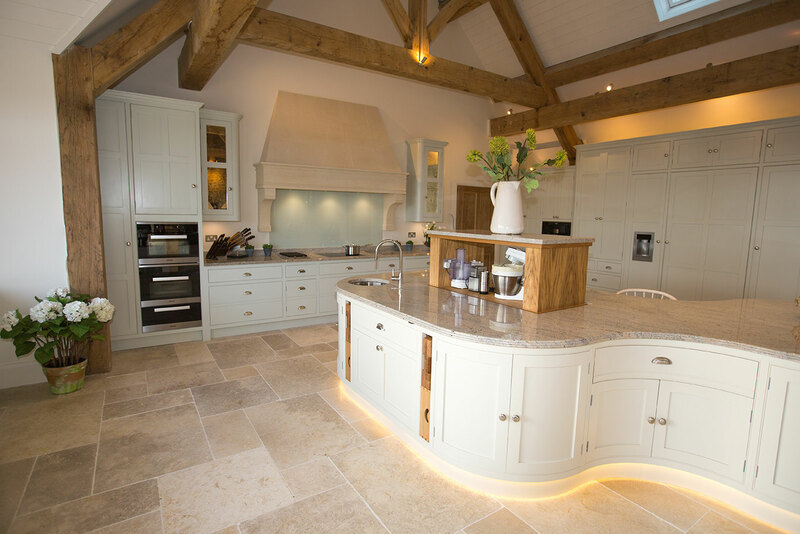 Is it a family kitchen, a kitchen for entertaining or for a keen chef? These factors will inspire different designs for different requirements. Then, it’s wise to consider various other factors that come into play, including the distance traveled between the key kitchen zones – cooking, washing and refrigeration. After this, it’s important to consider extraction and waste, as this can have a huge impact on the layout if proximity is restricted. What are your layout options? 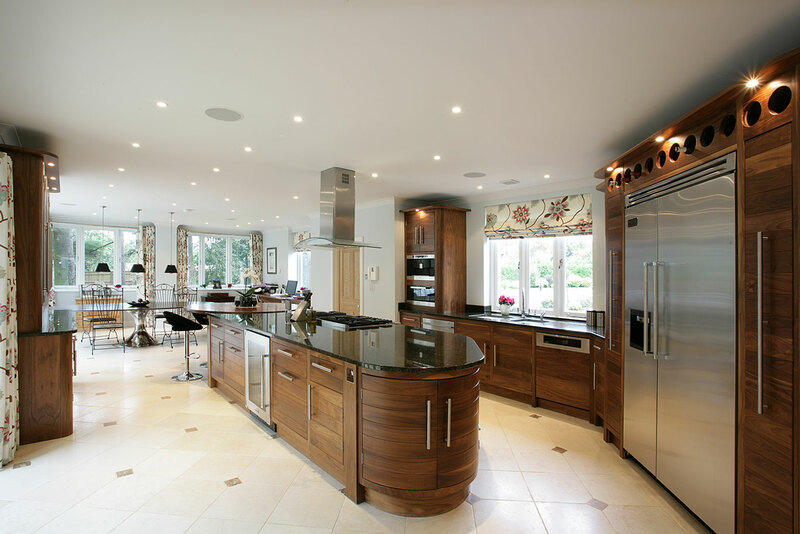 Technically, kitchen layout options range from galley, single-wall, L-shaped, U-shaped kitchens, or parallel-wall kitchens. 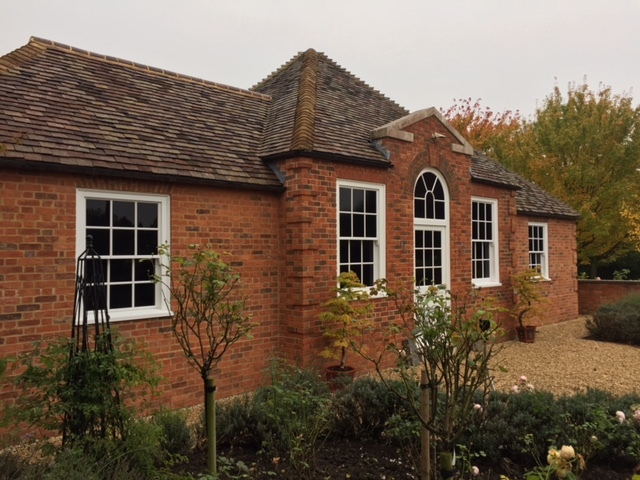 You may already have a specific space to work with, or you may have the option of choosing the best shaped space for you – we can help with either! 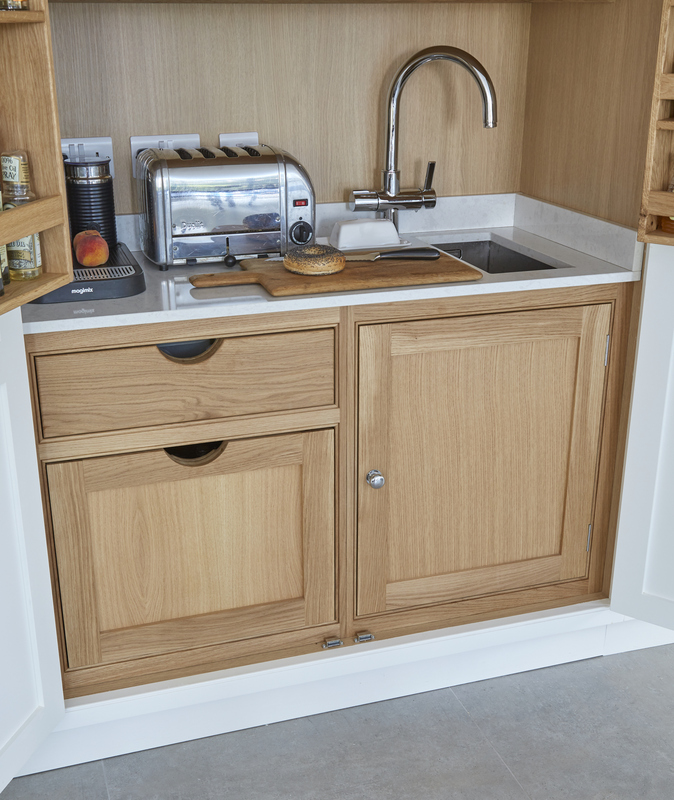 Just like the compact galley on ships, galley designs optimise space by packing in an abundance of storage and worktop area, making them ideal for small kitchens. To avoid a ‘corridor’ effect, where the kitchen feels small and enclosed, we opt for wall units or shelving, as this will help to open up the space. 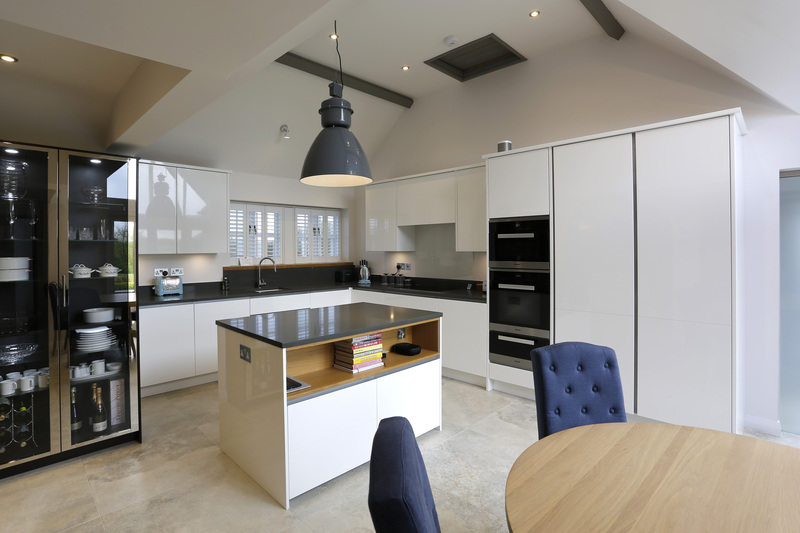 As pictured, using high-gloss finishes in pale colours really helps to reflect light and enhance a sense of space. 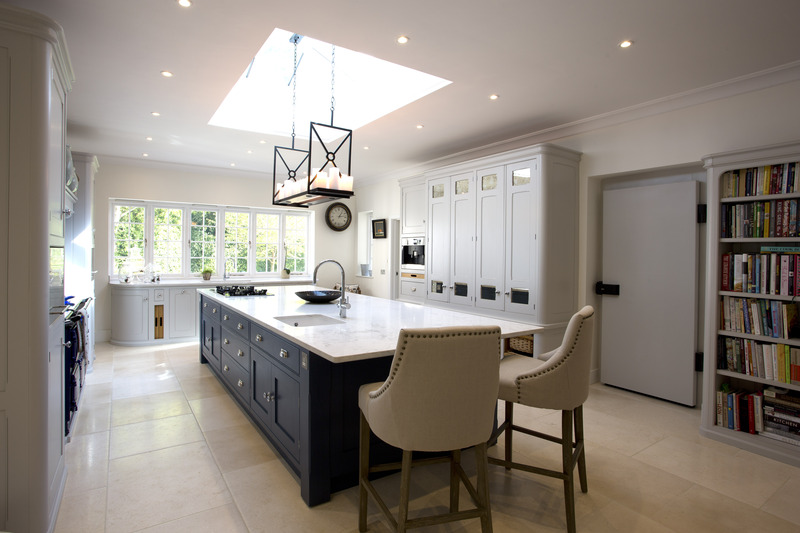 Where kitchen space is at a premium, a single-wall layout is a stylish and practical solution. 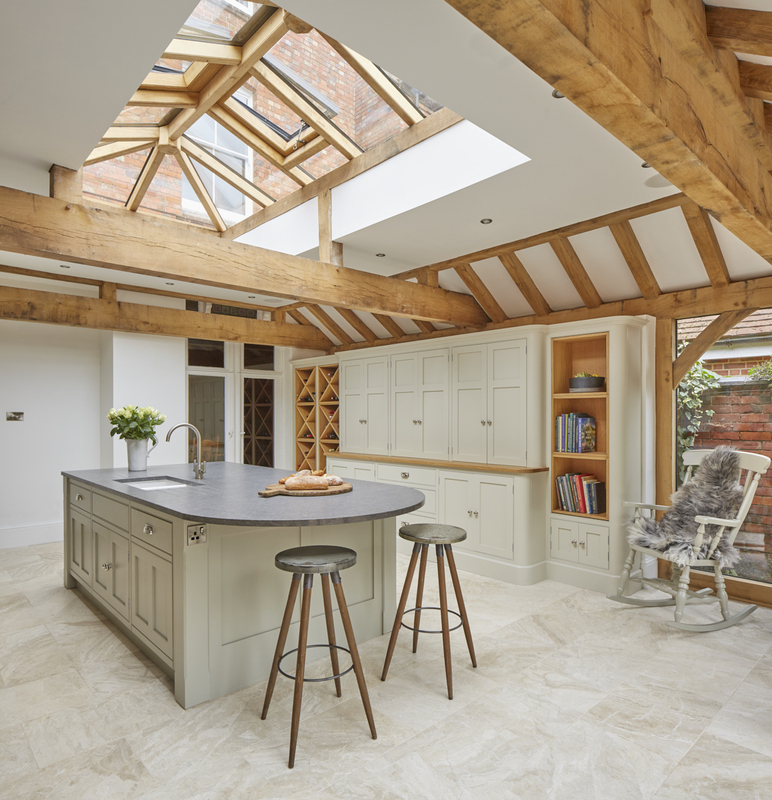 While its small footprint might at first seem to be a drawback, a single-wall kitchen encroaches less on an adjoining living space, freeing up more space. 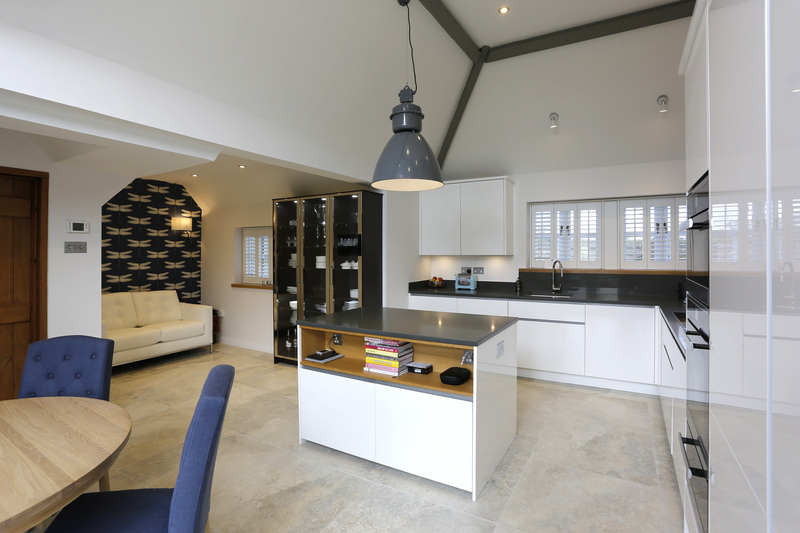 This open-plan design, pictured, is typical for a single-wall layout, and complements contemporary open-plan living. 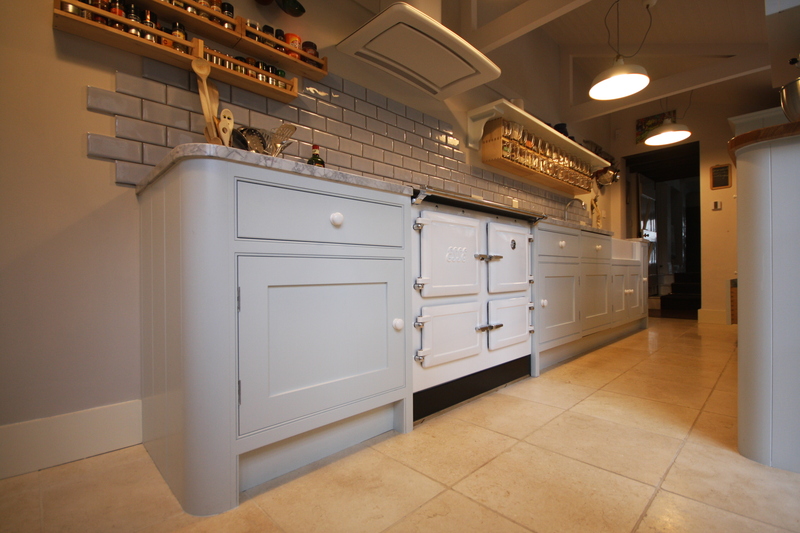 A classic layout that works in any sized space, the L-shaped kitchen is practical, concise and looks great. 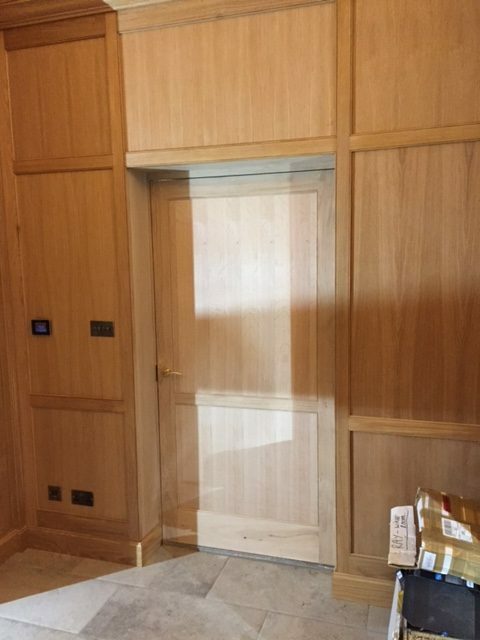 Often located in the corner of a room, this allows for plenty of movement within the space. 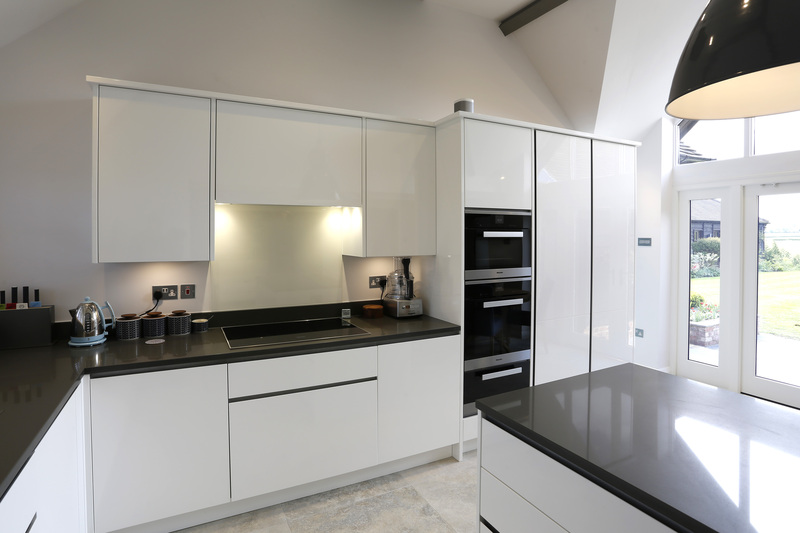 In a small kitchen, an L-shape is ideal as it concentrates all storage and appliances into two sides of the room, leaving the rest of the kitchen open and making the overall space seem bigger. 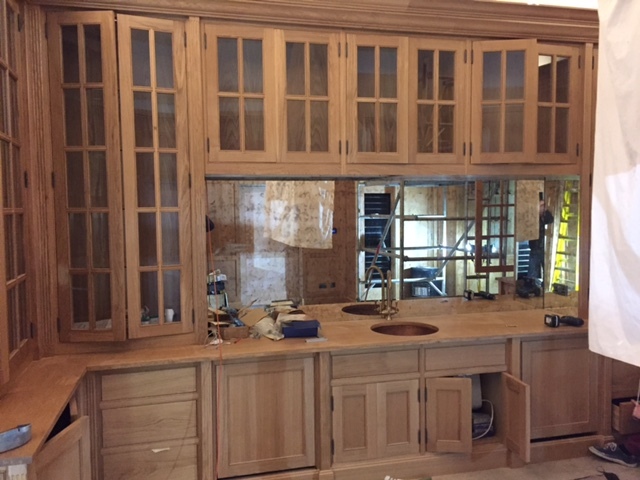 This layout works with all types of cabinetry and can be flexible to adapt to structural needs, such as sloping ceilings or large windows. 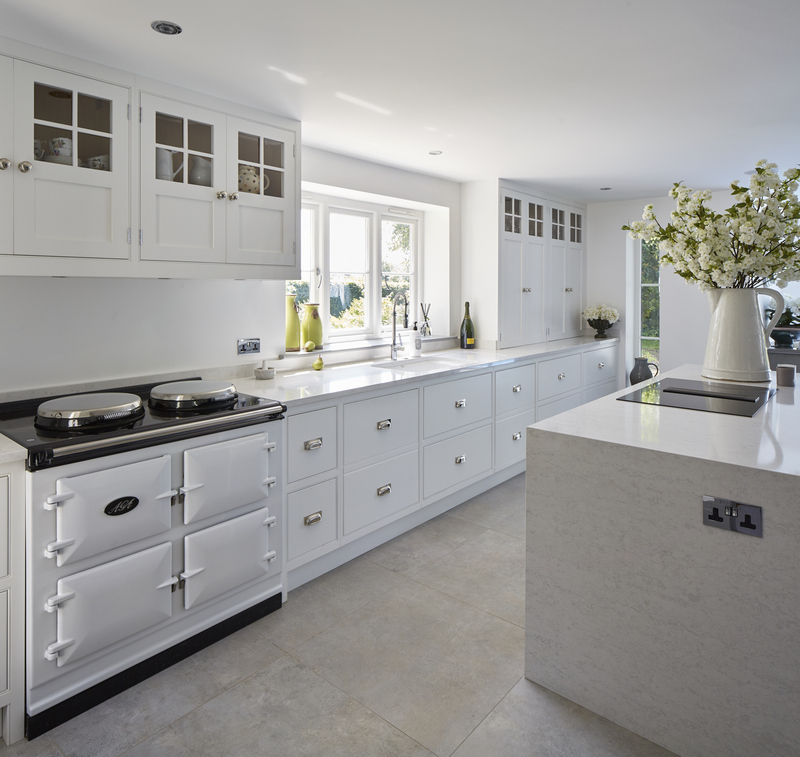 The U-shaped kitchen is probably the most practical of kitchen layouts, as it can provide an additional run of potential storage or appliance space compared with a galley kitchen or L-shaped kitchen. 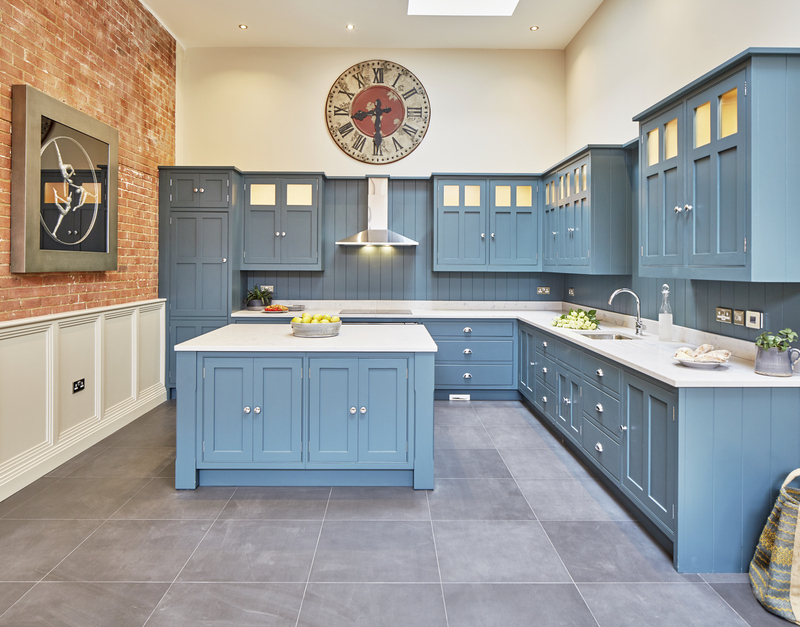 U-shaped kitchens work best in large spaces, but even small kitchens can benefit from its design, as long as you have at least two metres of moving space between the opposite units. 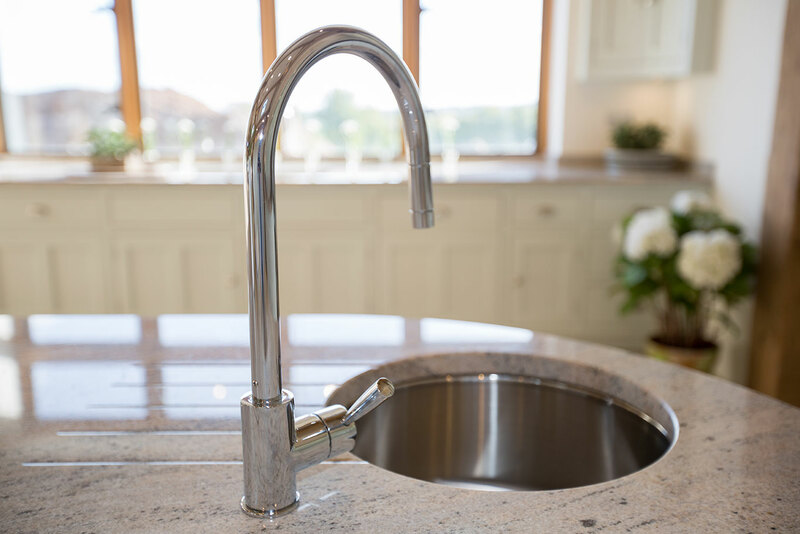 The design concept of the ‘golden triangle’ is a natural fit with a U shape, as you can keep your fridge, cooker and/or hob and sink on opposing sides to one another – making your kitchen easy and efficient to use. 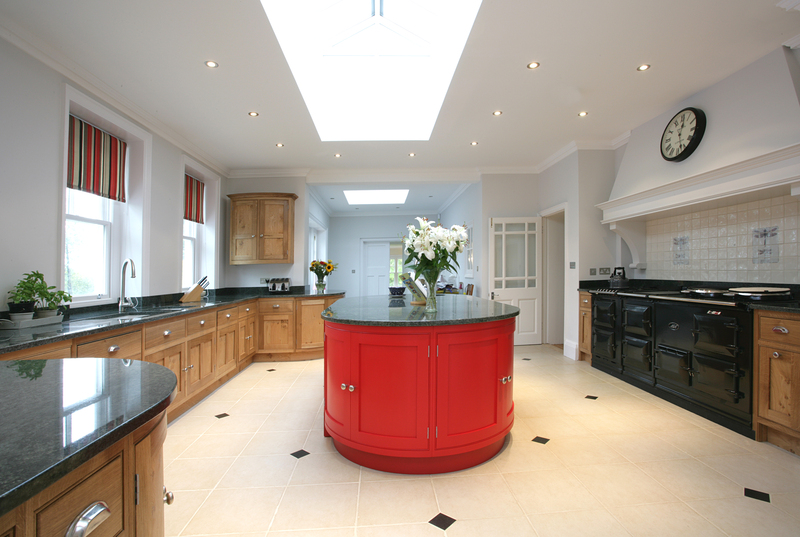 The parallel kitchen layout suits a range of homes, as it gives a a great deal of flexibility in the design your space. Making complete use of all the floor space, this model provides ample work and storage space, without looking cluttered. 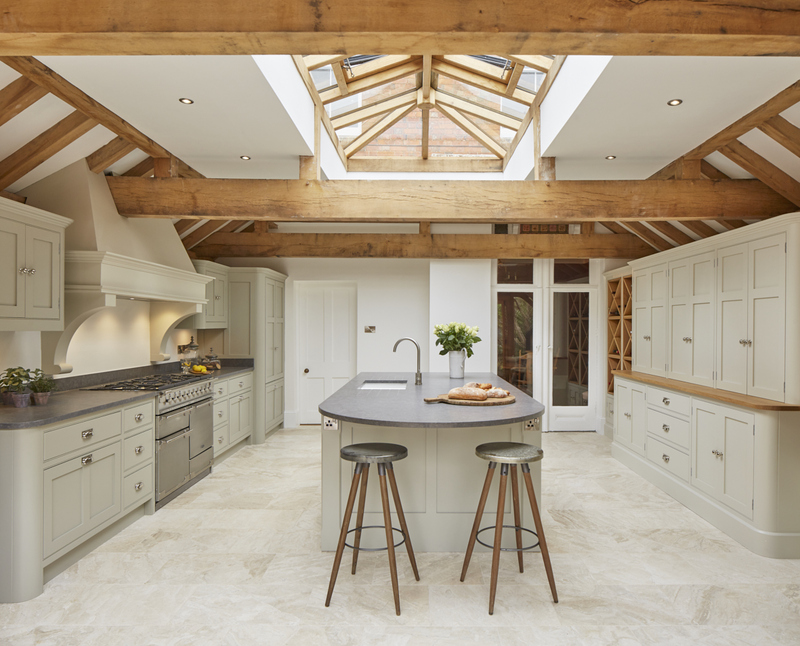 This simple layout can open up a room, allowing for a substantial central island, without disturbing the flow of the kitchen. 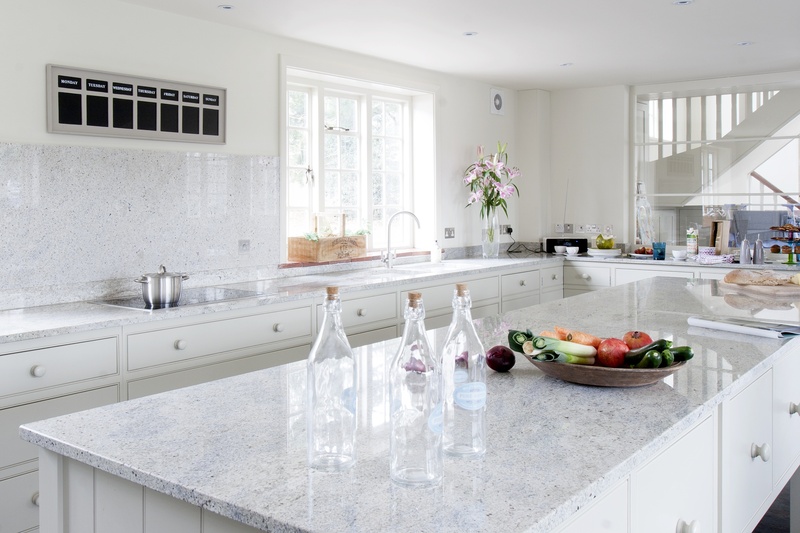 You can therefore have designated spots for everything you need on each side of the kitchen, making for an organised and efficient space. 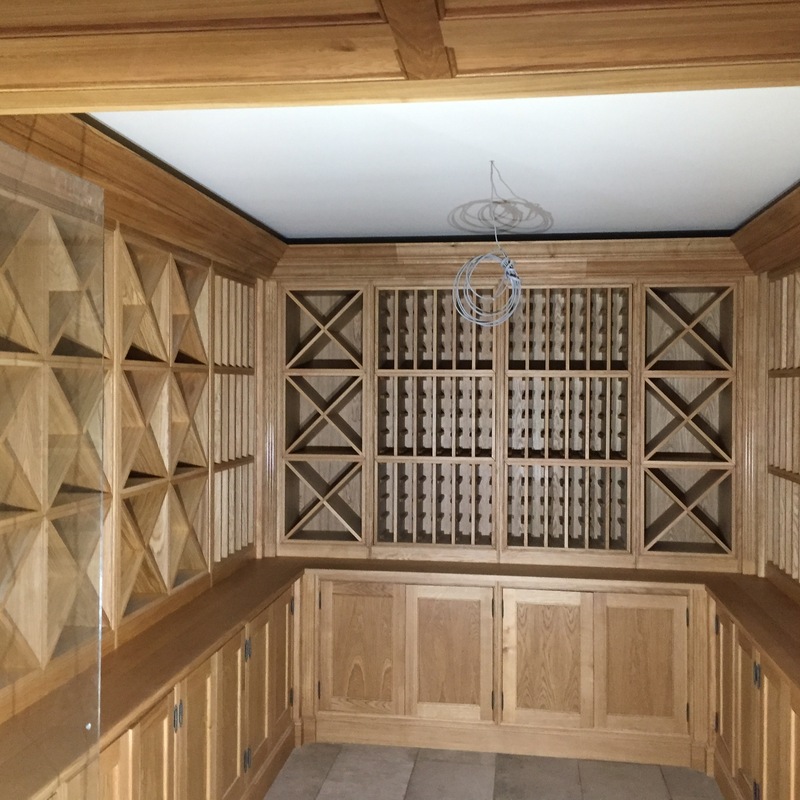 If you are looking to design your own bespoke kitchen and would like further information, John & the team would be delighted to help. 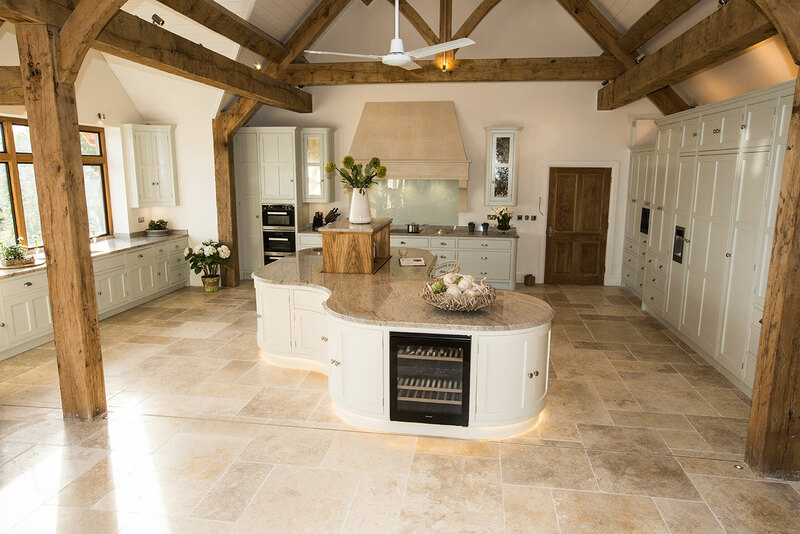 Here at Griggs & Mackay, we love to demonstrate our flare for design… especially when it comes to building beautiful, bespoke kitchen islands. 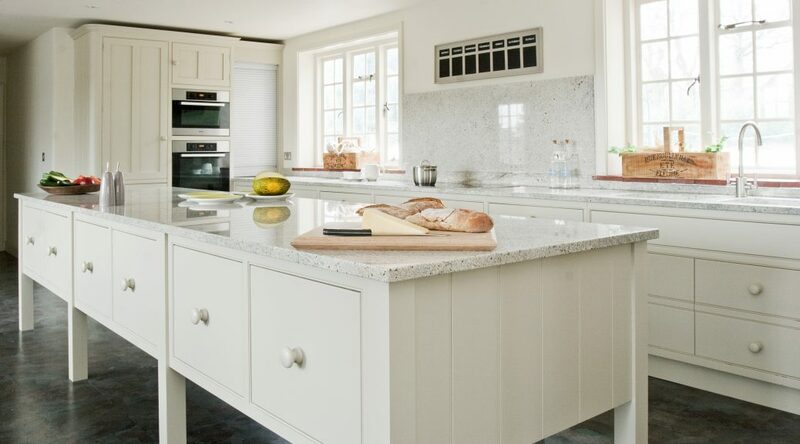 Whether to sit and enjoy a leisurely breakfast, or to sprawl out the ingredients for your favourite recipes – our kitchen islands are designed to be practical, multi-functional and in-keeping with your unique style. So, how best to decide on how you want yours to look and function? Here are a few of our most-loved Griggs & Mackay designs to inspire you! 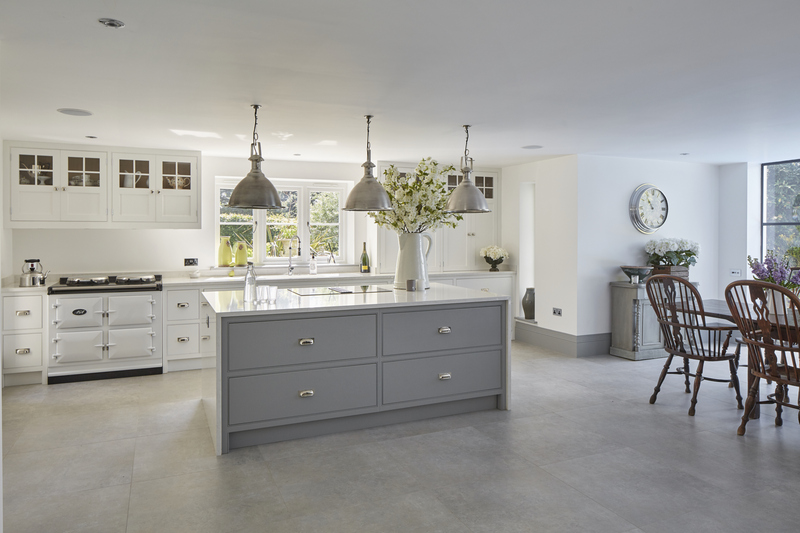 For a modern and elegant kitchen interior, introducing curves into your kitchen island design is certain to create impact. 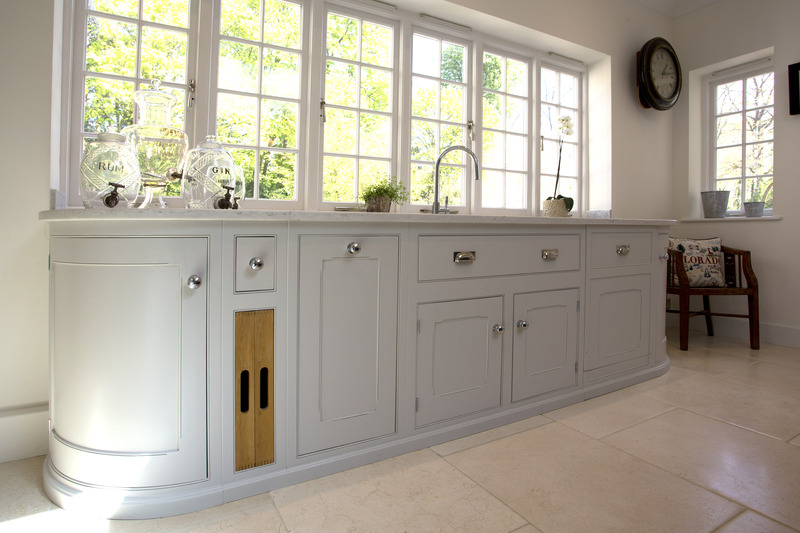 Flowing contours break up the straight lines of a traditional kitchen, for a space that is relaxed and comfortable. With deep drawers and cupboards for maximum storage space, an integrated sink and optional dining area, this curved kitchen island seamlessly blends functionality with unique design. 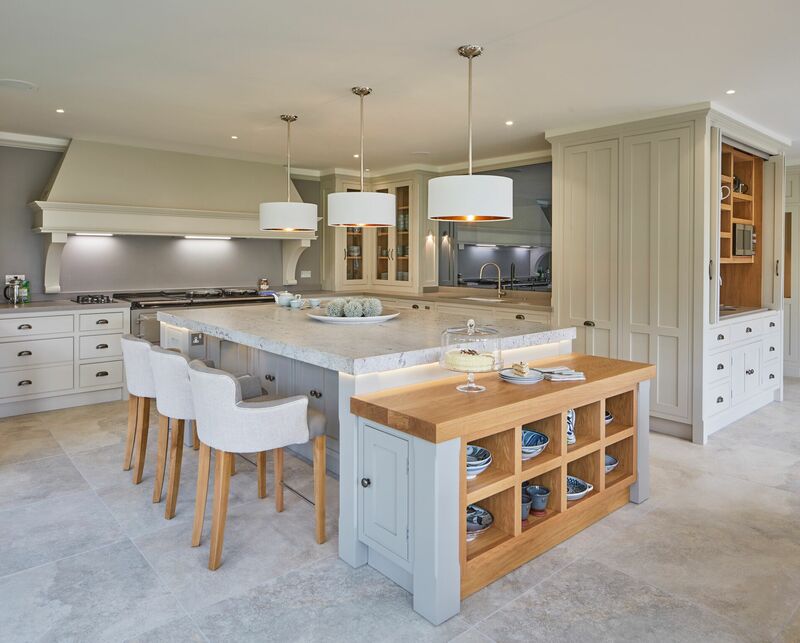 If you have an expansive open-plan kitchen, a split-level island can give both dimension and texture to the space, with each level providing different storage options and ‘zones of use’. Choosing to incorporate a combination of materials – such as marble, granite and wood – will further break up the space and create an exciting visual impact. 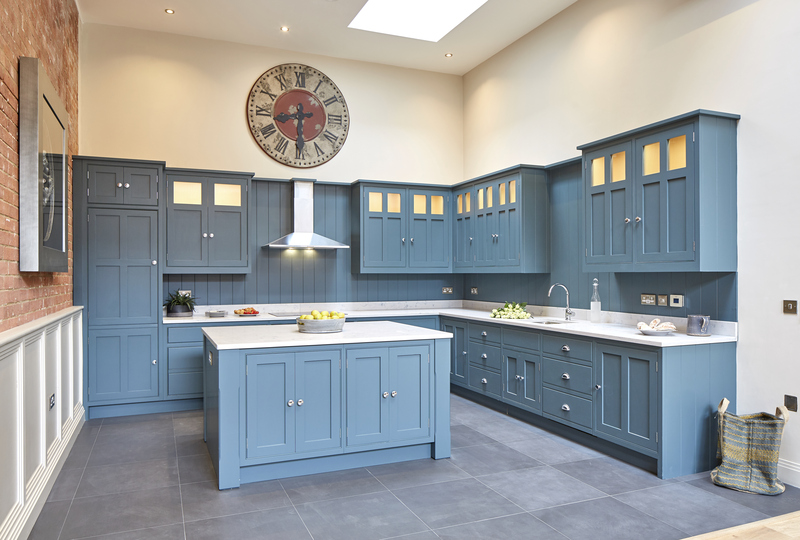 Sometimes your kitchen island insists on being the star of the show, whether you opt for a bold colour-pop, or a contrasting tone. By moving away from the more conventional colour schemes, you can really let your imagination run wild. 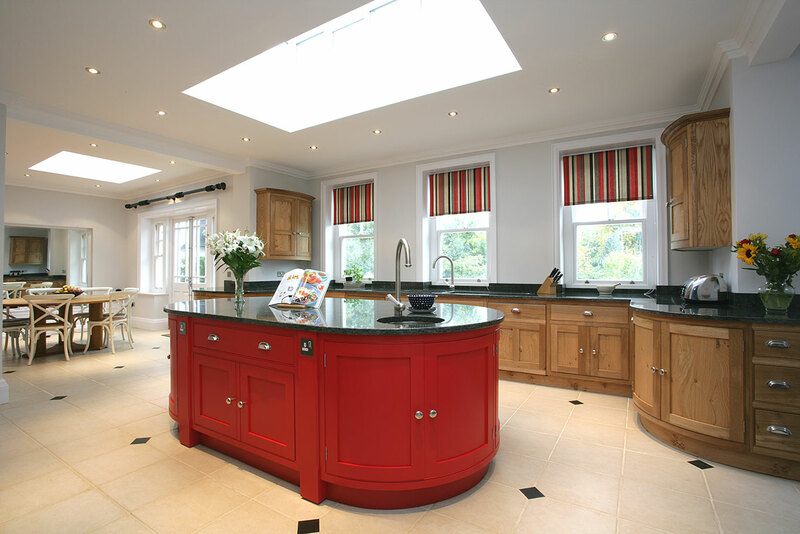 This pillar-box red painted island creates a stunning focal point, breathing a whole new life into this traditional kitchen design. 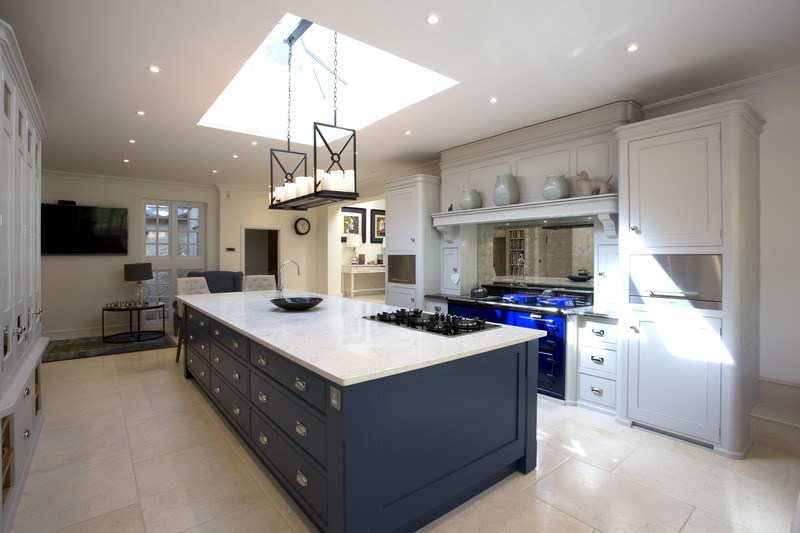 This large rectangular island was designed to mirror the beautiful ceiling light above, whilst also working with the dimensions of this kitchen space. A rectangular shape easily allows for an optional seating area to be created at one end. 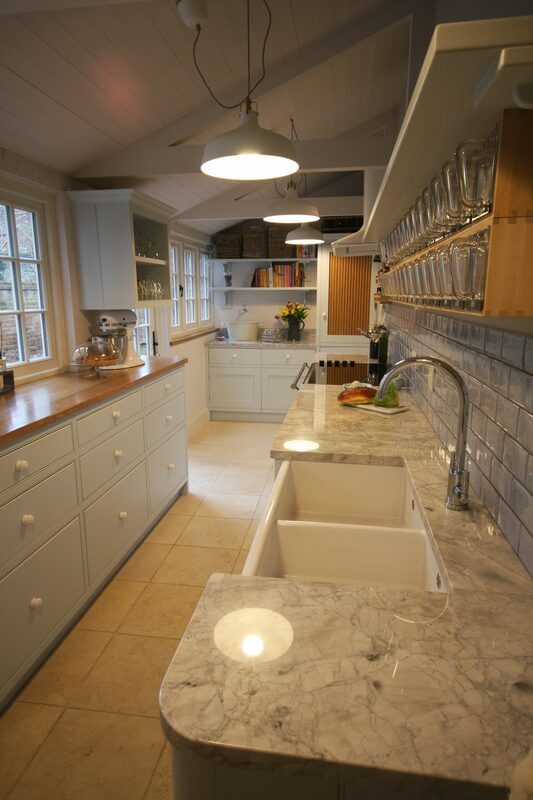 Plus, the addition of a small sink and hob means that everyone can get involved with food prep! 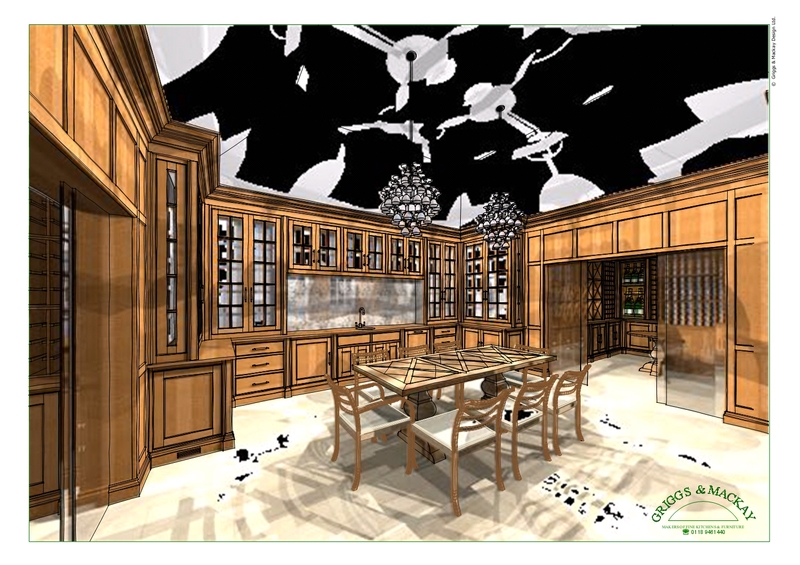 Sometimes a kitchen’s dimensions or structure won’t allow for a central unit. 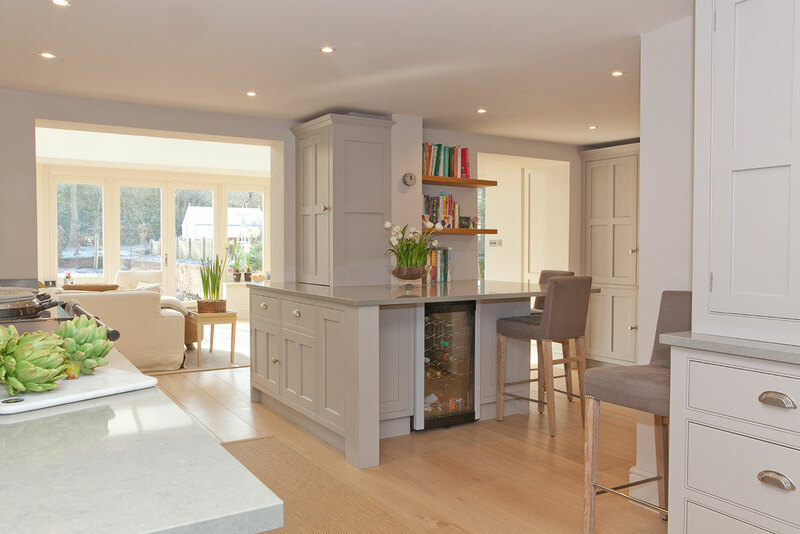 In which case, an integrated breakfast bar or peninsular island can create a versatile space to socialise and eat. 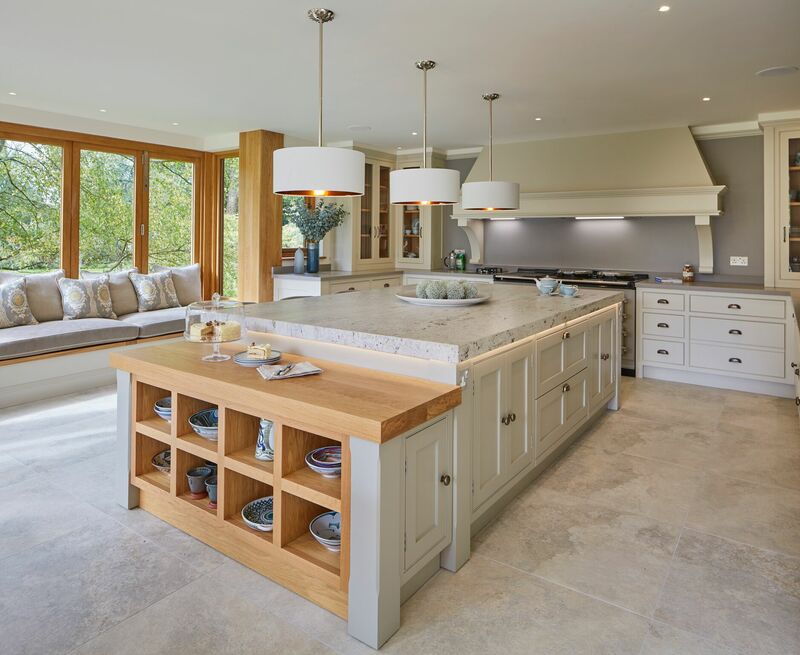 This type of island can also be a great way to section off living areas, whilst providing additional, ingenious storage space. 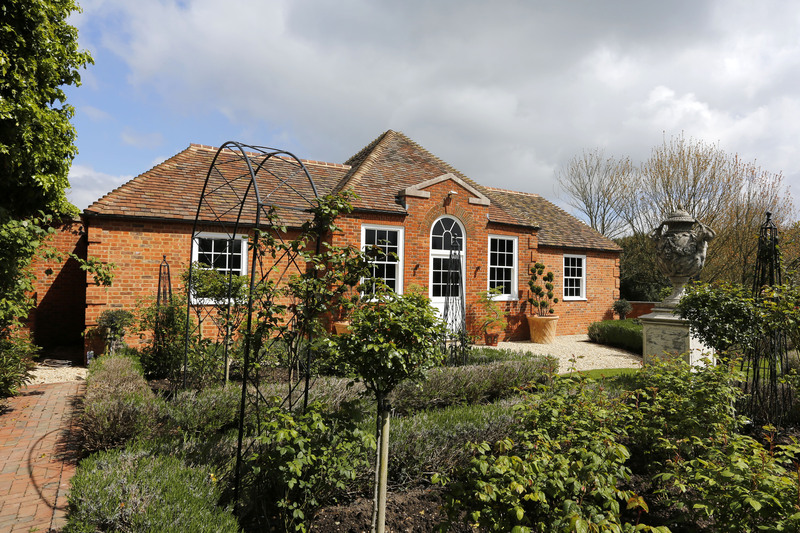 Have you ever dreamed of having your very own larder or pantry? Well, you might have noticed that they’re making a come-back… and you don’t need to live at Downton Abbey in order to have one! 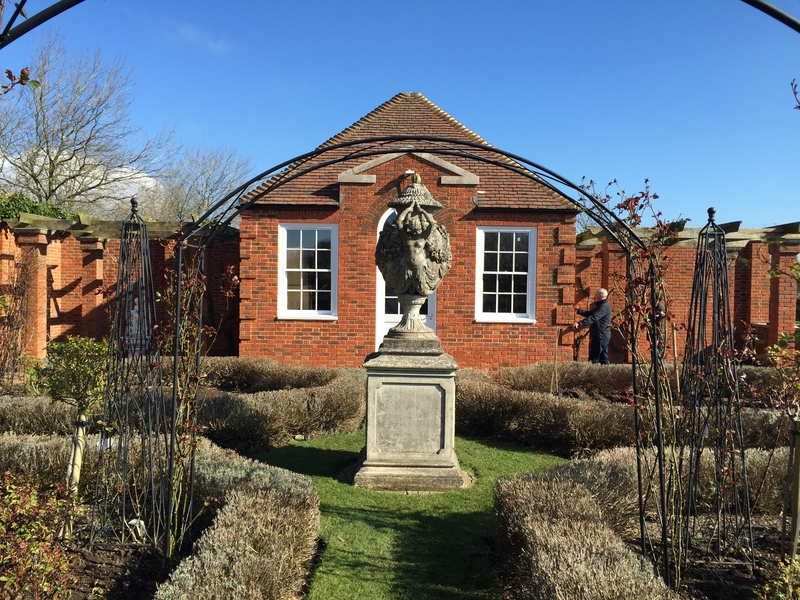 Once a mainstay in a hardworking kitchen, the larder was a necessity for keeping meats, dairy and eggs fresh, but since modern refrigeration, the humble larder fell out of fashion within the contemporary kitchen. Now we might be a little bit bias, but we love a good larder and we’re thrilled to see its revival at the Griggs & Mackay workshop! 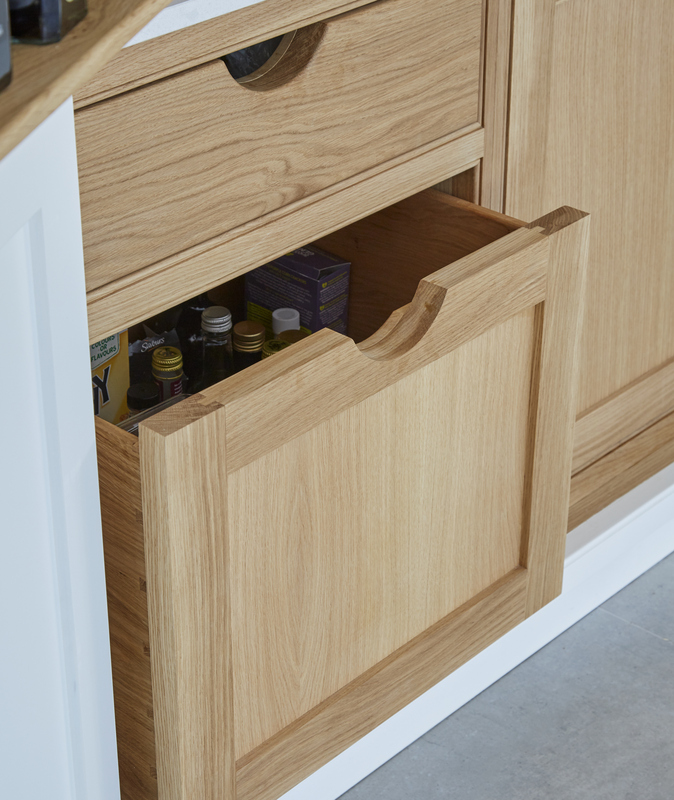 With it’s excellent and versatile storage options, it’s no wonder the larder cupboard has found its way to the top of many of our client’s wish-lists. One of the greatest benefits of having a larder cupboard is that they don’t always require a lot of space. 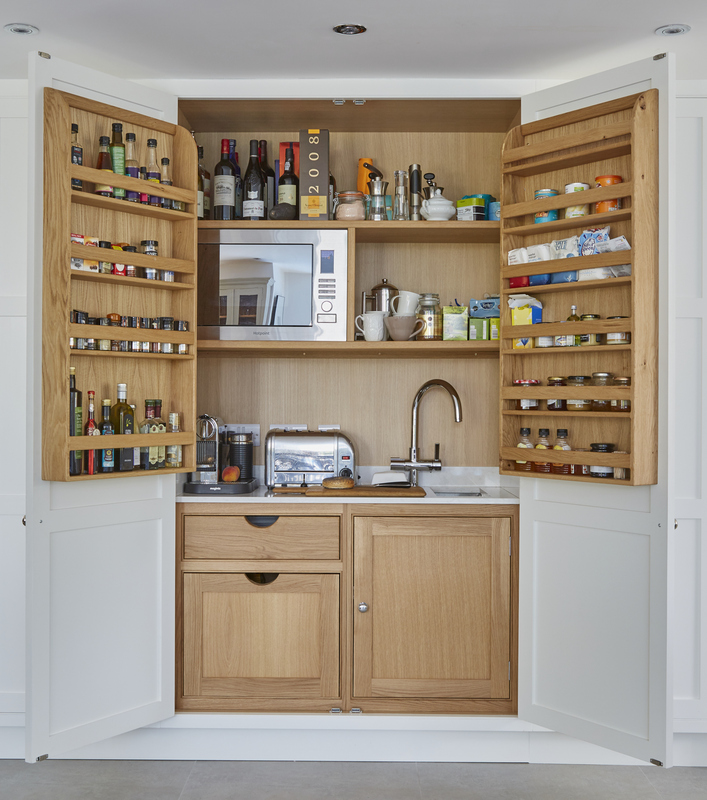 Depending on your kitchen, you can opt for a single, slimline larder with just one door, a half-larder that sits on a worktop, or if you have plenty of space to play with, then a full-size double larder is worth every penny. 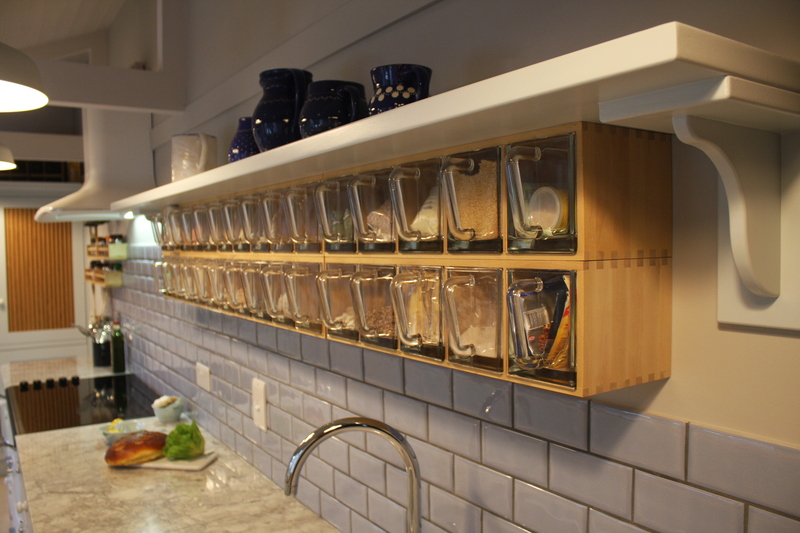 Plus, larders aren’t just for storing food anymore! 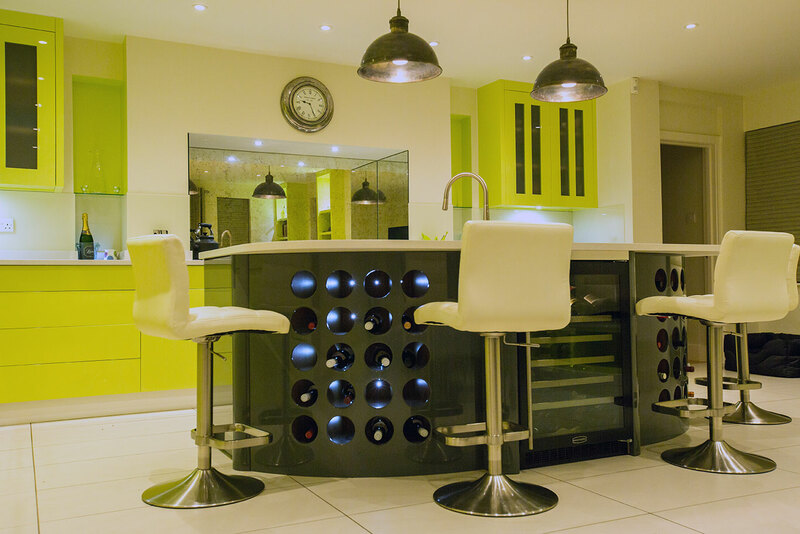 They can hold small appliances, serve as extra worktop space, or work as a tea and coffee or breakfast station. 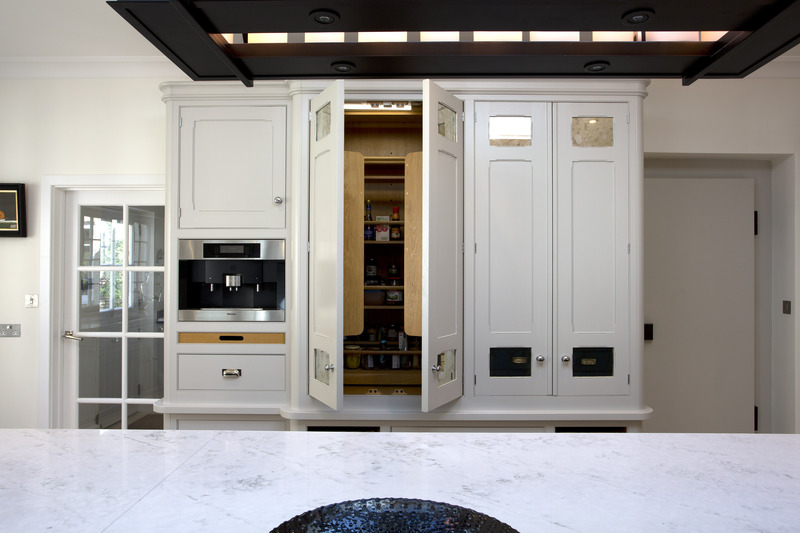 This impressive double larder was designed to store a multitude of different items. With shelves, racks and draws to boot, everything from foods and spices, to china and appliances all have their place. 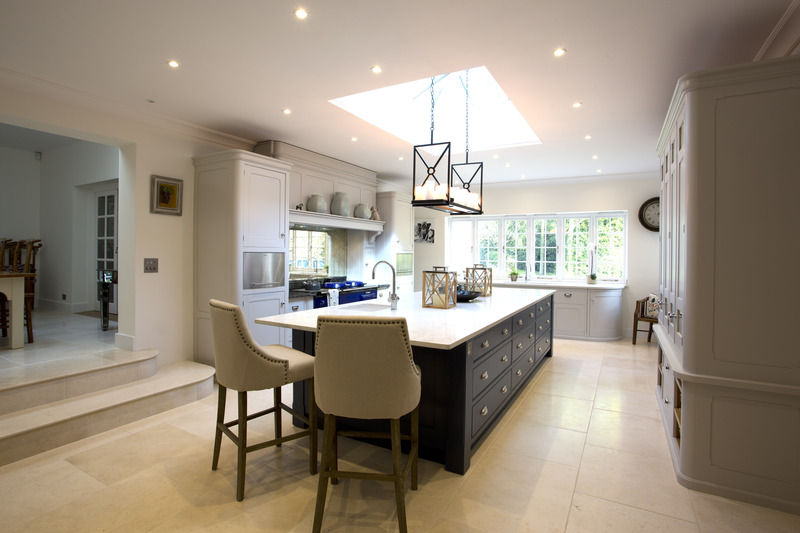 When closed, this fully integrated larder flows seamlessly with the rest of the kitchen cabinetry, skillfully and stylishly hiding away the everyday mess of a family home. 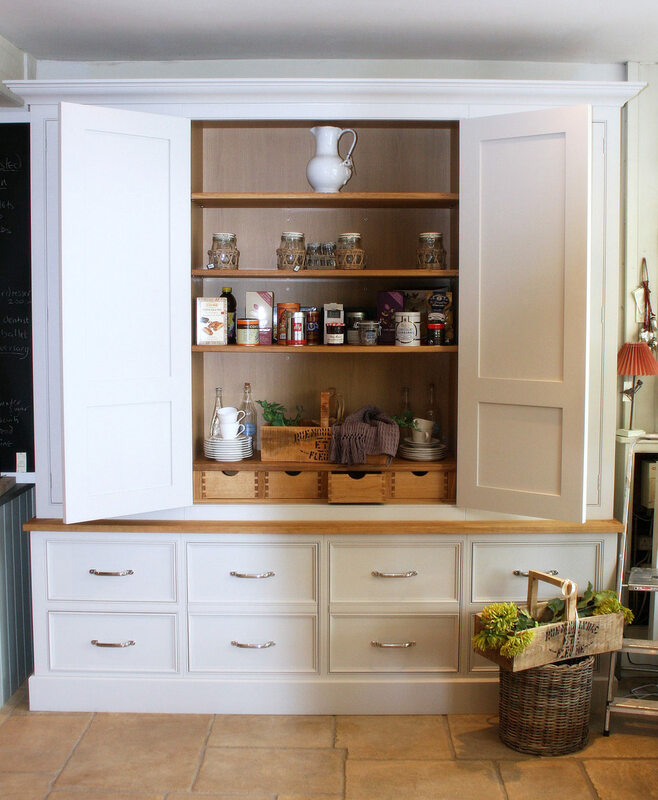 A freestanding larder unit is a great option, especially if you don’t want to change your whole kitchen. 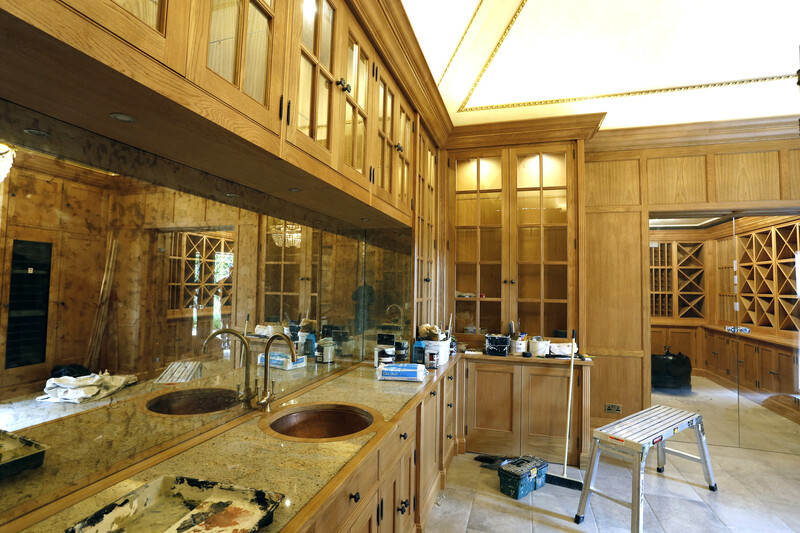 They can be designed, built and painted to fit the rest of your cabinetry. 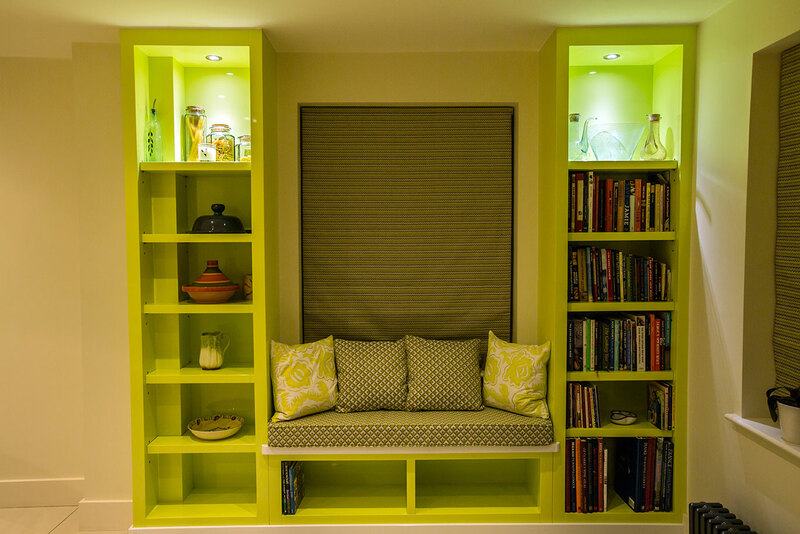 With tardis-like depth, you can really make the most of the endless storage space it provides. With adjustable shelves at different heights, an assortment of items can be neatly stored and easily accessed. 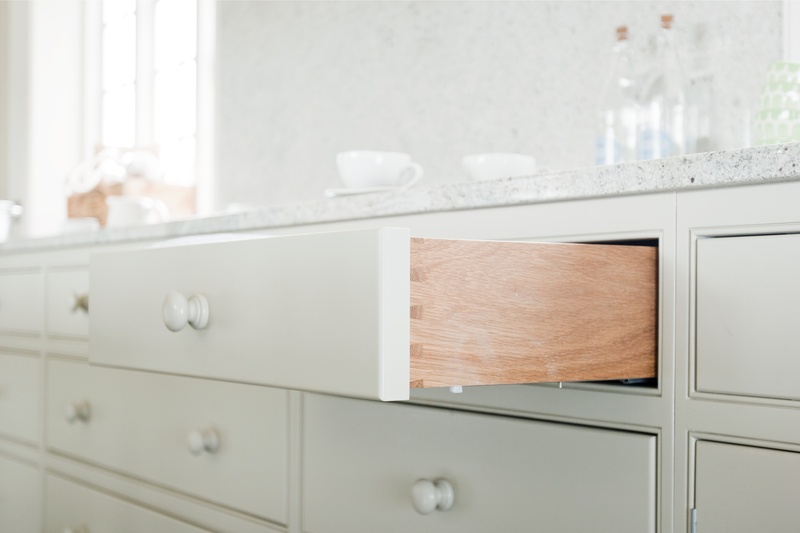 Below, deep drawers offer further storage for tidying away crockery, or even pots and pans. 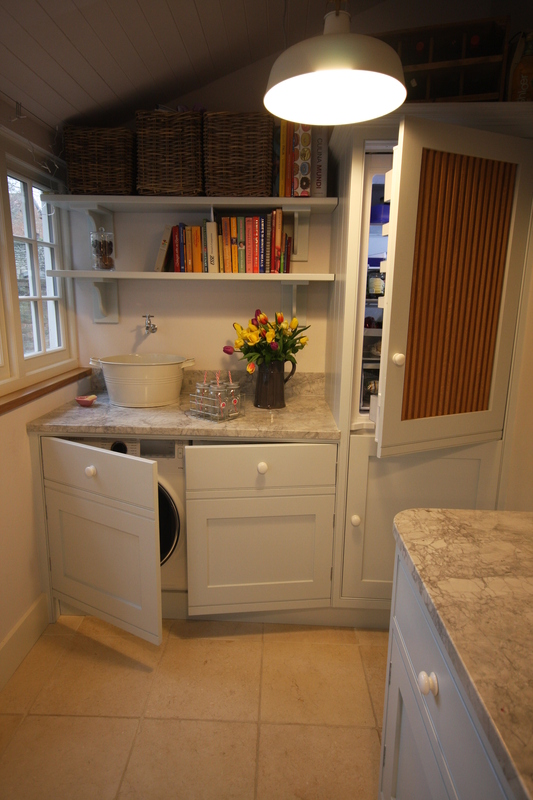 We loved creating this modern twist on a larder unit, as it shows just how versatile a larder can be. This coffee and breakfast station was designed to hold everything you need to start the morning off just right! 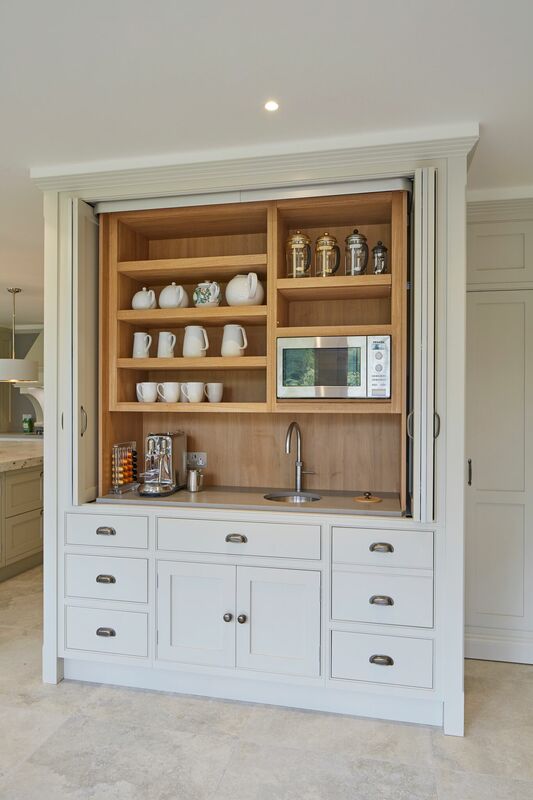 Bi-folding doors tuck seamlessly away to display teapots, cafetieres and crockery, whilst integrated appliances are ready for use. 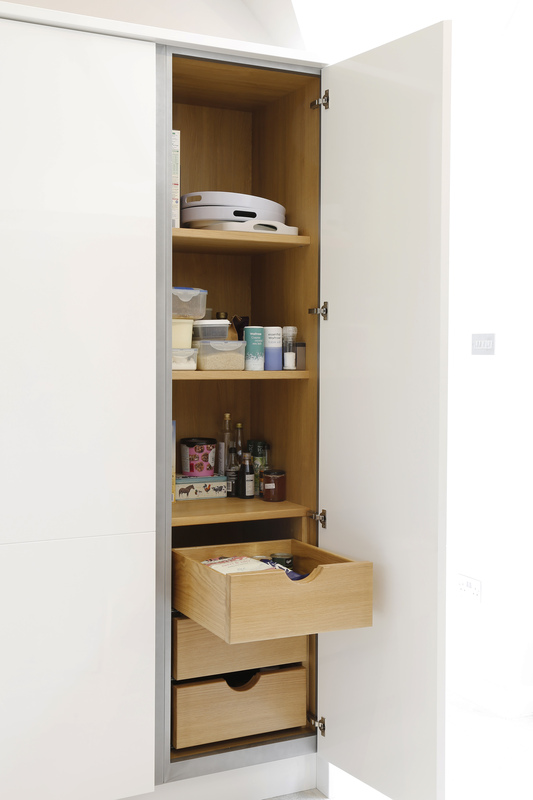 Plus, with plenty of drawer space below, all tableware and linens can be kept together in one place. 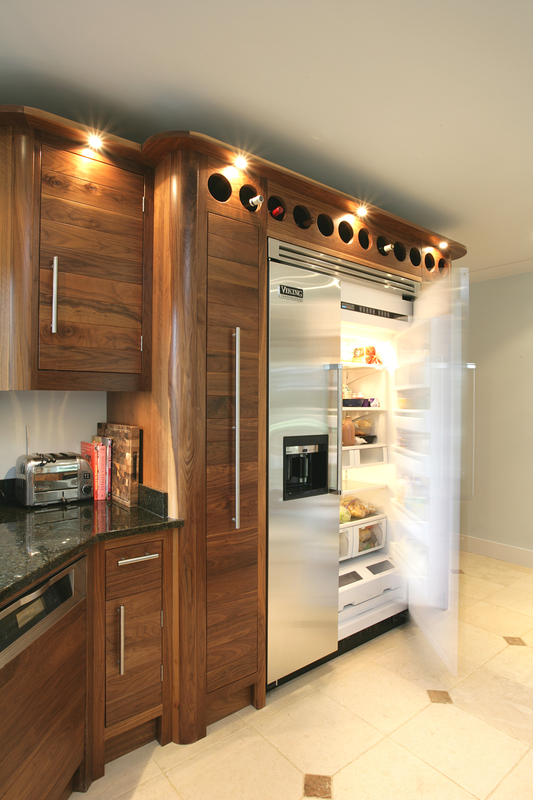 Now don’t be deceived, as even a modest larder can accommodate what would otherwise be stored over several cupboards. 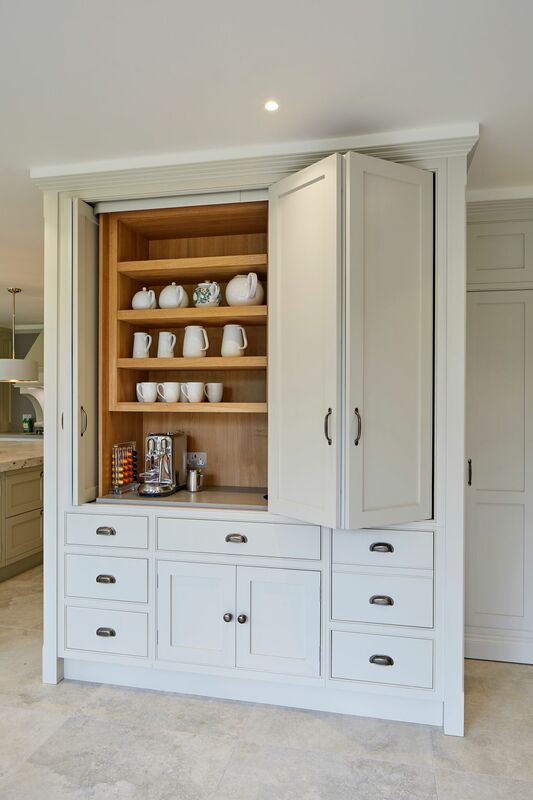 With spice racks mounted on each door and pull out drawers that run the entire width of the unit, you can ensure that nothing will get left in the back of cupboard. 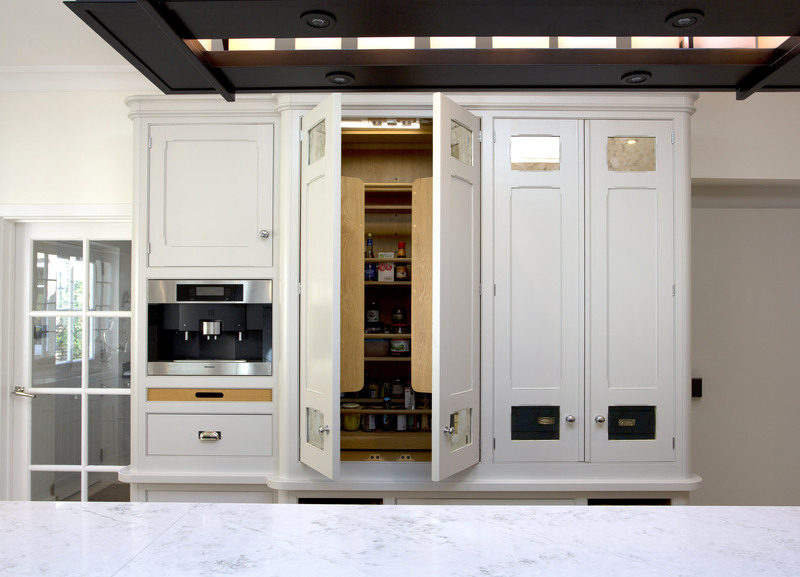 If you only have space for a single-door larder unit, then a narrow and full-height design would be a great option. It’s also perfect for putting in a corner, with both static shelving and pull-out drawers for easily reachable ingredients. 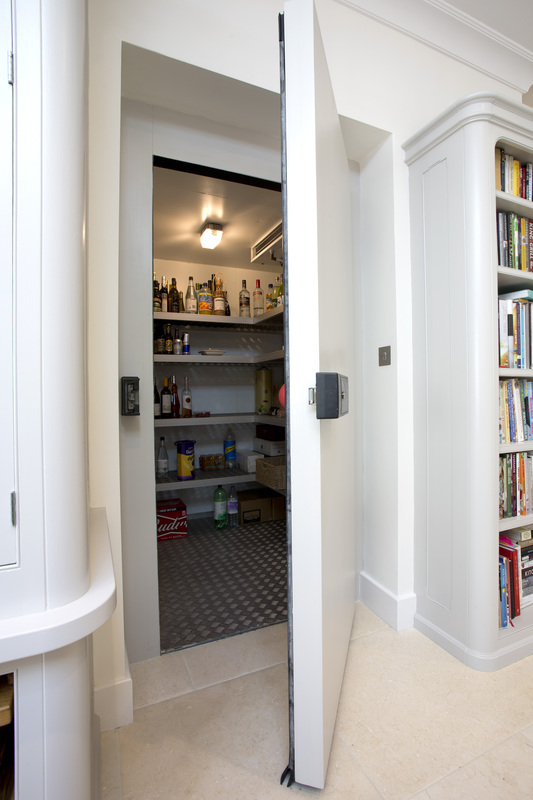 For those with plenty of space, a walk-in larder is a great way to store and manage all of those household essentials. 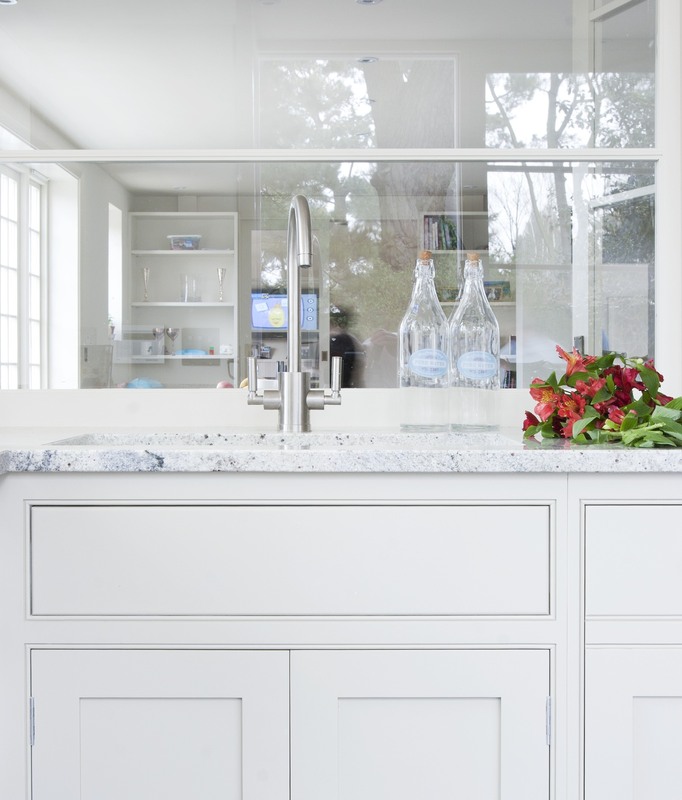 This design allows you to keep pretty much all your dry ingredients in one place, meaning you don’t have to rummage through countless cupboards trying to find that one key ingredient! 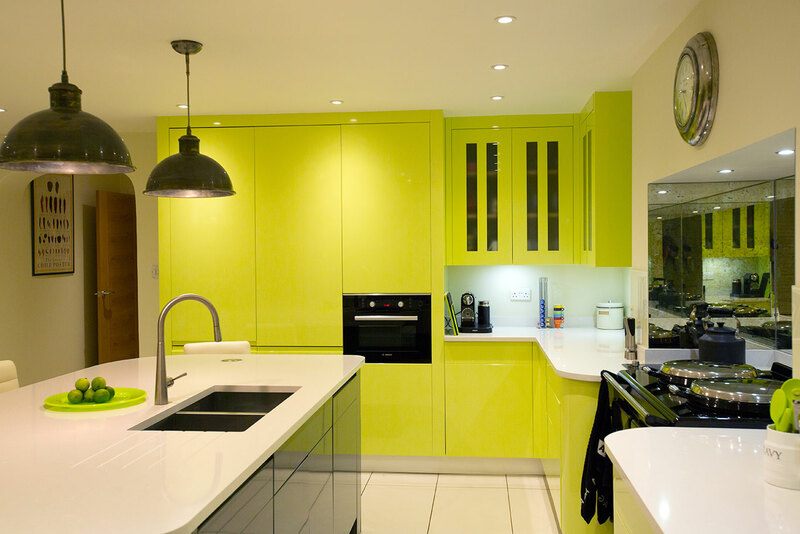 It’s also a excellent idea if you want to quite literally close the door on visual clutter, maintaining a calm and relaxed feeling in your kitchen. 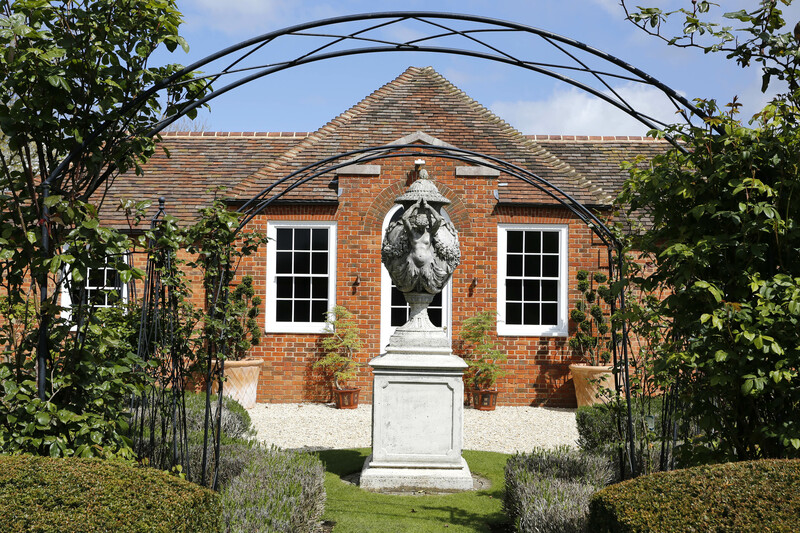 Welcome to Griggs & Mackay’s new blog! We are currently compiling all the best and beautiful bits from our latest projects, including our work in St Tropez and a very special wine cellar! Keep your eyes peeled as this will be coming very soon!